The novel is about a thief who is extremely good at what he does and runs a team of conmen who are all very good at what they do. When the blurb says that the novel has a distinctive Ocean’s Eleven feel to it, it is right. The novel does have that in spades. I found the overall premise to be quite fun, but the characters and setting didn’t really get me invested in any of it. And part of the problem was the length of the novel. When SFF novels are this big, you can usually expect a lot of padding and The Lies of Locke Lamora certainly has that in significant amounts. The novel is pretty much an origin tale. We see Locke Lamora when he is pretty much a street urchin and we see him grow to become one of the most notorious thieves in the island city of Camorr. There are three distinct stages to the story. The first is the reader meeting Locke and seeing his training as a thief and a conman. The second is seeing Locke, many years later, enacting a con-game against one of the wealthiest merchants in the city. The third involves his entire world being turned upside down and him having to fight to regain some of what he is lost. I don’t exactly have a problem with origin tales per se, but Scott Lynch really drags that first stage considerably. So much so that I found it to be quite irritating by the time it was over. There are several interlude chapters throughout the novel, and they all give background on the characters and the events in the novel. The entire first stage and the interludes really bring down the pace of the novel, which is at its best in the second and third stages, when there actually is some significant action going on. Locke on his own makes for a rather bland protagonist. His supporting cast is actually much better, the members of his Gentleman Bastards thieving group and his boss, the Capa Barsavi who rules over all the criminal business in the city. There is more depth to either of them than there is to Locke because we get to see far too much of the protagonist and its easy to get lost in all the details here. The novel is almost an excruciatingly detailed story of Locke’s rise and fall in the criminal underworld of Camorr. And the details aren’t just limited to that aspect. Scott Lynch is, technically speaking, a perfectly fine writer. Its just that he writes events and characters in such minutiae that instead of coming across as three-dimensional, they come across as bland and boring. And having to sit through a book of this length with characters like that, the experience is rather poor at best. However, I loved the entire concept of the city of Camorr, built by an ancient race and abandoned for years until Mankind moved in and claimed it. And all the politics of the city, whether criminal or otherwise, do make for some enjoyable reading, but unfortunately none of it can overshadow the faults of the book. 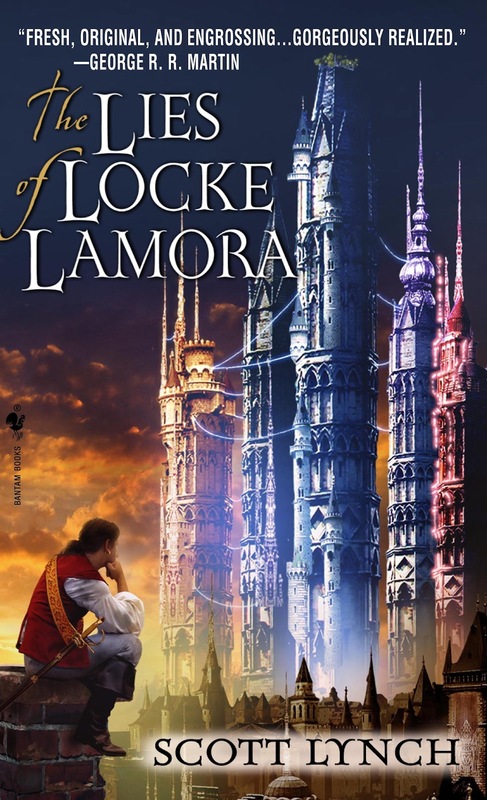 The Lies of Locke Lamora isn’t a bad novel per se, but neither is it a good one. Its middlingly decent. Still, I have to say that I’m quite intrigued to go on with the series. While I didn’t exactly care all that much about Locke and his supporting cast, the events did come across as interesting, and the novel ends on a fairly decent wrap-up, even though the climax itself proved to be disappointing. Perhaps I’ll be reading the sequel as soon as next month, or February. Posted on December 8, 2013, in Book Reviews, Review Central and tagged Book, Book Review, Crime, Fantasy, Fantasy Heist, Gentleman Bastards, Gollancz, Heist, Heroic Fantasy, Locke Lamora, Review, Review Central, Scott Lynch, The Lies of Locke Lamora, Thieves. Bookmark the permalink. Leave a comment.